So Buzzfeed already sorta beat me to this one but in case you happen to be cruising the internet today and in case you are so bored that you are actually on my blog a) seriously, I am so sorry, it’ll get better b) I thought I’d provide a little Yuletide cheer to lift you from the dismality you must inevitably be reeling in. Lucky for me, because gift wrapping is not my forte and I usually forget to buy gifts on time. I’m becoming more Catholic by the day, aren’t I? Sometimes I get depressed with the state of the world. Sometimes I want to point the finger. Sometimes I have to turn around and point that finger right back at myself. 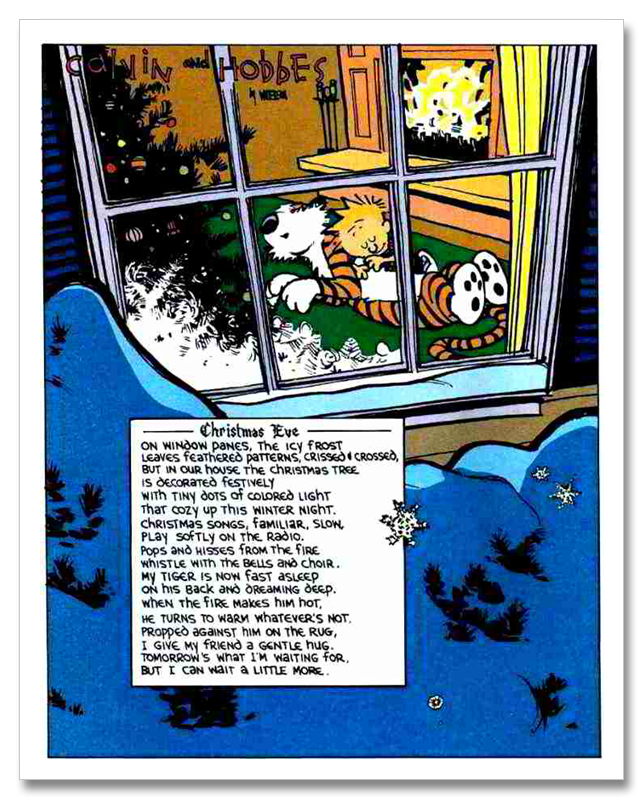 Just a few tidbits for you from Mr. Watterson. Remember, lest anyone think I’m more important/rich than I am and think these ideas are my own, they’re not- so there. I said it. Now you can’t sue me. I think that’s how this copyright stuff works. Now please, get off the internet and definitely get off this blog. Go read the first chapters of Luke, drink hot chocolate, watch snow fall outside (or pretend its snowing if you live too far south). Snuggle up a loved one, pet or a pillow…whatever you do, wherever you are, I pray that you are able to enjoy Christmas with those nearest and dearest to you. 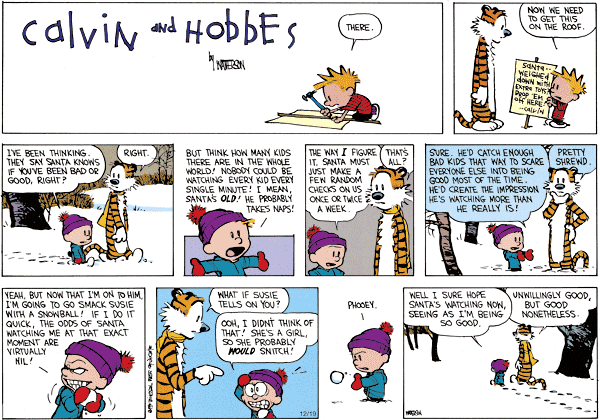 If not, Calvin and Hobbes is as worthy a substitute as any. Number 2 – This will change once you are married or your life will be hell. Number 5 – That’s me. Number 6 – When you point a finger at someone else, you have three pointing back at yourself. Haha! Sorry you were bored but glad Watterson could keep you company. Good thoughts for sure. Hope you’re gearing up for a Happy New Year. And sorry for that pun. Really.